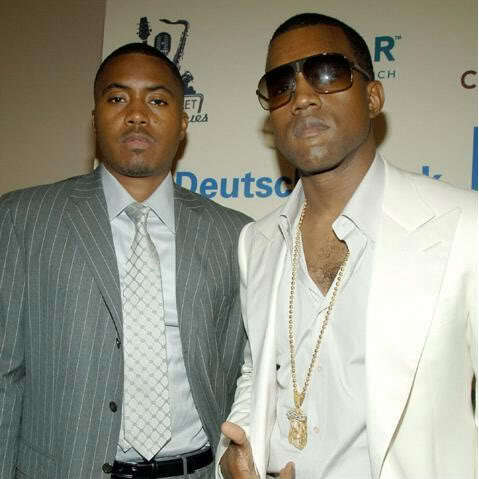 Recently, there’s been much speculation within Hip Hop industry rumor mills concerning Kanye West’s interest in signing frequent co-collaborator Nas, and after ‘Ye announcing he & Nas had an upcoming announcement to make (like, why didn’t they just make it RIGHT THEN, right? ), their official collaborative union may very well come to fruition. Whereas the Hip Hop masses appear to be ready to flood Times Square with balloons & streamers over this proposed musical endeavor, I personally feel compelled to go against the grain and cringe at the thought of a seasoned Rap vet such as Nasir Jones temporarily putting his creative life in ‘Yeesy’s seemingly Allstate-like hands. I’ll even go as far as to call it a mistake on Nas’ part – not the worst one he’s ever made in his career (you DID see Belly, right? ), but a mistake all the same, at a time where the artist formerly known as Nasty can’t afford to make many more….. like, LITERALLY can’t afford it. Will Records, The Firm supergroup….) – yep, all Escobar Jones! Yet, through it all, the man’s phone never stopped ringing for guest appearances, never really cried broke after his departure from Searchlite Management, and was able to get something really nice & shiny to put on his arm – no, not a blingy Rolex, but R&B superstar Kelis, who eventually became his wife. All’s good with Nas at that point, right? Yeah, ok…. whatev. First (and I’ll always say it until they come widdit), G.O.O.D.’s track record – not a very fruitful one by industry standards. Kid Cudi’s the only G.O.O.D artist to pull the kind of reaction & revenue ‘Yeezy’s money is capable of pullin’ – and don’t get me started about the Common disappointment! Ugh! Second, the whole “rapper signed to another rapper” scenario – the ONLY time in the history of the genre where an ESTABLISHED rapper signed with another rapper’s regime and the outcome was an acclaimed AND profitable album was Mystical’s signing to No Limit (sad that THAT’S the only occurrence, isn’t it?). I challenge anyone to name another one. Maybe there is & I forgot it, but I don’t think so – and if there are other examples, the odds are still HEAVILY against Nas’ successful signing to G.O.O.D. based on this point alone. (1) Kelis: Dude JUST got that killer of a child support hit lessened – the LAST thing he need to do is show the courts he’s big ballin’ enough to spring for a label & some artists! What’cha wanna bet Kanye don’t sign Nas to a multi-million dollar contract if it goes down! (2) His Business Moves: No secret here – the boy couldn’t negotiate his way out of a wet paper bag. If Nas started a label, no one associated with it would have the funds to supersize their McDonald’s fries 3 years after its jumpoff. Any doubts? Didn’t think so. (3) New York: NO disrespect to New York Hip Hop fans – say it again…. NO DISRESPECT, but generally speaking, they’re the flakiest in the US in regards to an artist’s label status! Point blank, they ain’t f*ckin’ with major playas forced to leave the major labels – never have, never will. NY is the home of the majors (no pun intended…. trust), & a drop to indy status means you took an L to NY Hip Hop fans. It’s not at ALL like the West or the South fan bases, where an artist can eat lovely selling music out the trunk of his car if he had to – indies thrive in every other region BUT New York, straight up! Nas going that route would be career genocide, no juice! Ask The Lox, Fat Joe or AZ what it’s like to be independent in New York – though I wouldn’t stand within arm’s reach of them if you do. Just sayin’. Don’t get me wrong, this looks like a GREAT deal on paper: Nas working with Kanye West – what more could a ask for in a Rap release, right? Just keep in mind that there’s WAY more to this move than one might originally think, and if Nas is smart, he’ll carefully weigh his options before Bic’ing his name on the dotted line – or those scene in Kelis’ “Milkshake” video of her dancing around smiling while Nas is in the diner flipping burgers may not be too far from reality! ~ by Professor Mike on January 14, 2011. Good read. The music that came out of Common and Ye’s union was good, it just didn’t sell because, hell NOTHING sells these days. Especially something intelligent. Nas probably won’t do huge numbers, but I see no reason why the music won’t be good. As far as Kid Cudi his stuff is just “super duper” weak. Good read, can’t say that I agree with the conclusions but the strenth of the argumenet is compelling. Love it! William’s humor shines through while still being a very good argument.